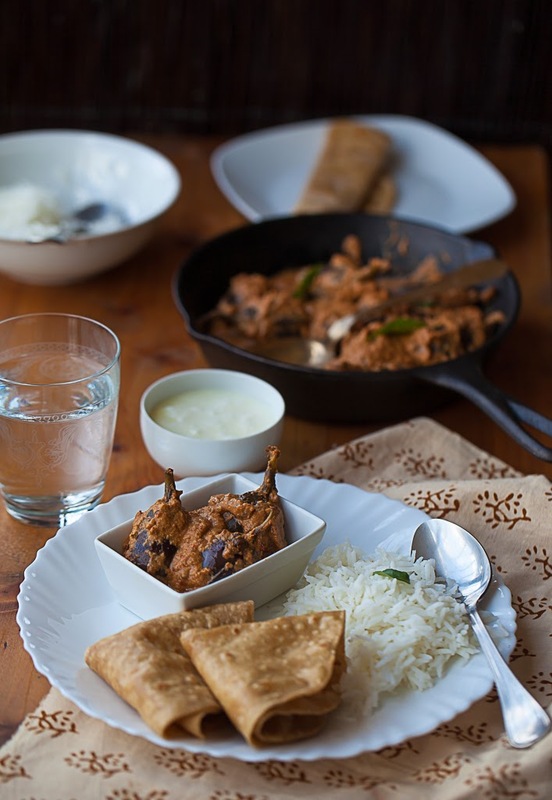 Today I bring to a dish that is straight from the city of Nizams. 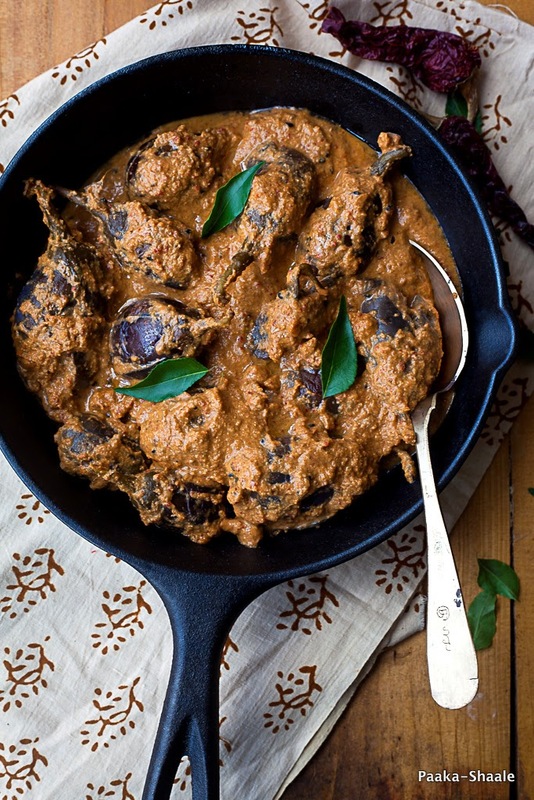 The Hyderabadi bagara baingan is a mixture of the Nizami cuisine and the rustic Andhra cuisine. This dish is perhaps the one of the best ways to cook eggplants. Baghara baingan literally translates to tempered eggplants. 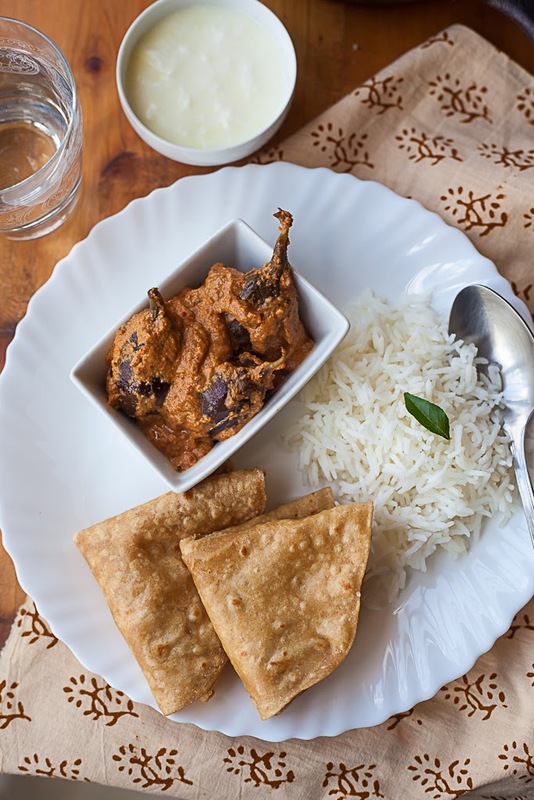 The method of sautéing the eggplants in oil that is tempered with aromatic spices, takes the taste quotient of this to another lever altogether. 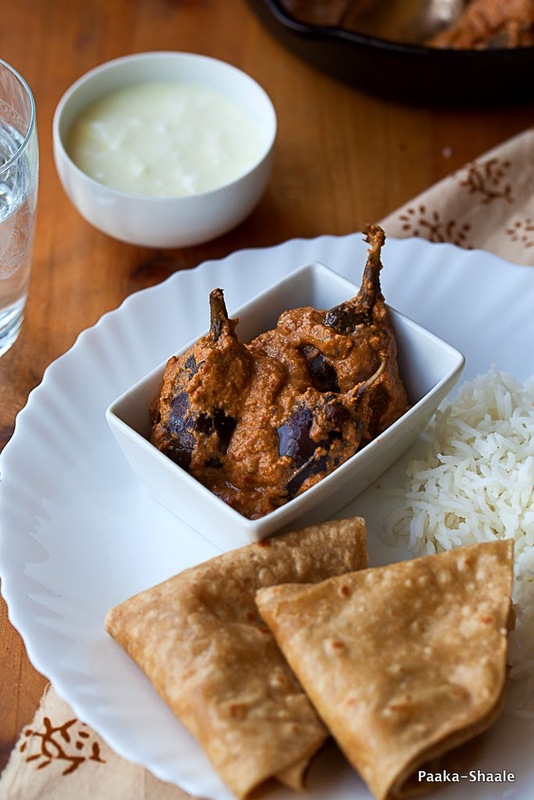 The irresistible flavor of the bagara baingan lies in it's spice mix. 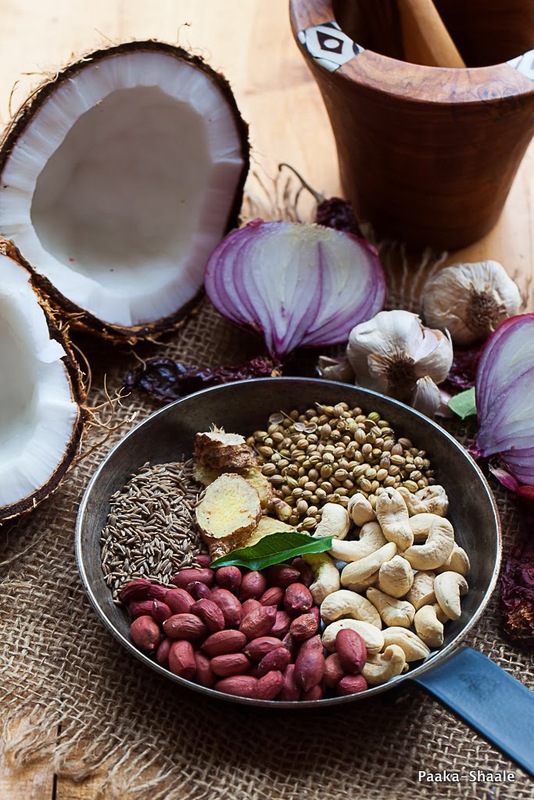 The spice mix is a unique blend of spices, seeds and nuts. Fascinating isn't it? Baby eggplants are first sautéed in oil and then simmered in the spicy gravy. This process of cooking the egg plants twice, makes them acquire a rich creamy taste. Wash the eggplants and pat them dry. Slit the eggplants length wise into fours but keep the stems intact. This way, the egg plants remain joined at the stem. Keep aside. Heat a tspn of oil in a separate pan and add the cumin seeds, peanuts and cashew nuts and fry for a few seconds. Add ginger, garlic and chopped onion and fry for a min. Add the turmeric, coriander seeds, coconut and Kashmiri red chilies and fry till the mixture is brown. Allow the mixture to cool completely and blend to a fine paste using a little water and keep aside. Heat oil in a thick bottomed pan and fry the egg plants till brown and tender, remove and keep aside. Add the nigella seeds to the same oil and allow them to crackle. Stir in the curry leaves and fry for a few seconds. Add the ground paste, tamarind pulp, salt and jaggery and mix well. Add the sautéed egg plants and 1/2 cup of water and cook covered over low heat till the egg plants are cooked through and soft. Serve the curry hot with either rice or rot is. Looks fantastic & mouth watering.. nice entry..great clicks..
All of those flavors sound divine! Gorgeous photography thanks for the tips. 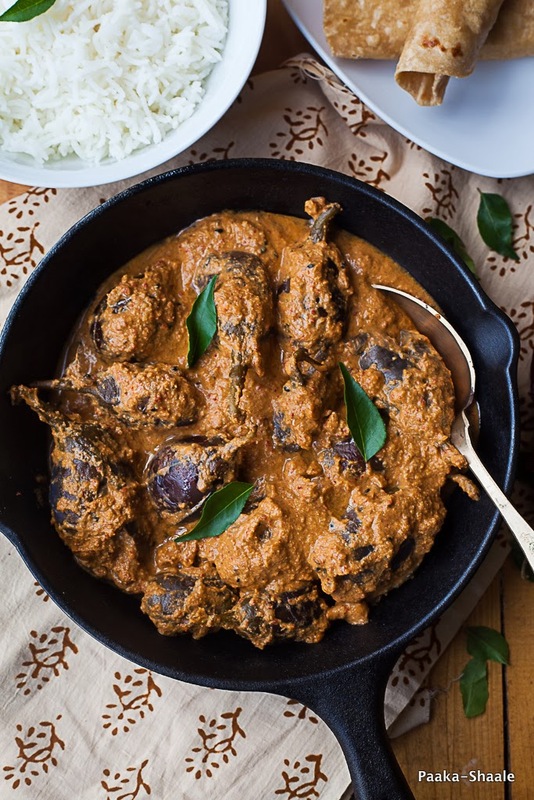 Curry looks very tempting, I like the picture of brinjal, nice shot. Baigan is one of my absolute fav veggie. This dish I remember tasting once long back at work where this colleague of mine got it for lunch. His mom is a great cook and looking at your pictures, I can almost recall how delicious it was. Thanks for sharing this. I have to try it out. Scrumptious! This mouthwatering dish looks and sounds really wonderful. This looks really fantastic! 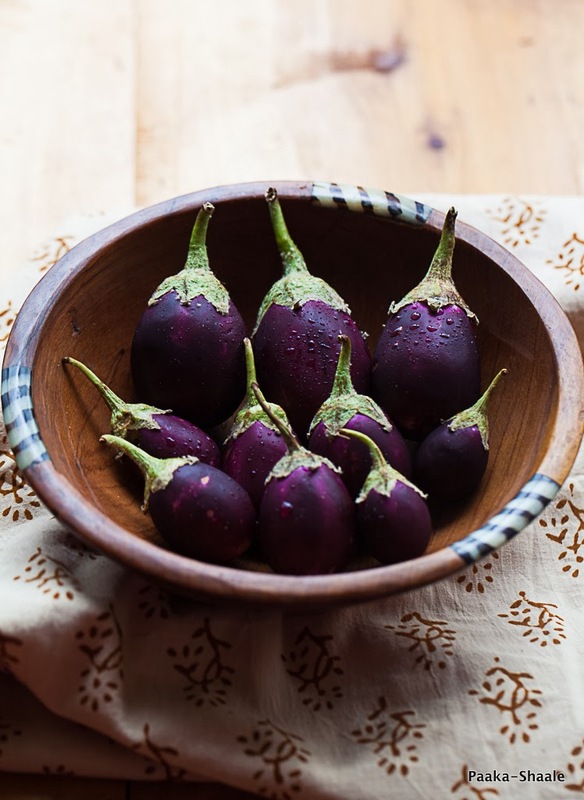 I love baby eggplants and the photos are so beautiful! Congratulations for being the Your Best Recipes winner! G'day Your recipe and photos look wonderful, true! I am here after a long time and I loved your background and the blog theme. It's beautiful! I love Baghara Baingan and yours looks so creamy and delicious!